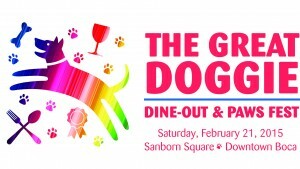 To celebrate ‘Love Your Dog Week’, there will be plenty of free paw-raising ‘fur and fun’ unleashed as the general public and their pooches come out to enjoy The Great Doggie Dine-Out & Paws Fest (GDD&PF) held to support Tri-County Animal Rescue (TCAR), Saturday, February 21st at Sanborn Square in Downtown Boca at 72 North Federal Highway. Held from noon to 9 p.m., themed activities for pet lovers of all ages and their furry friends kick-off with opening ceremonies that include a TCAR parade of alumni pups and their families, yoga and massages for dogs and their owners, a first-ever Great ‘Smooch Your Pooch’ Challenge, and Yappy Hour Singles ‘Speed Dating With Dogs’. There will also be curbside dining by Gourmet Truck Expo, a Tails & Tales Showcase featuring pet-centric vendors and event sponsors, contests and prizes, entertainment with doggie dancing and an after-dusk ‘big screen’ movie-in-the-park pet feature film presentation. Promoting ‘all things TCAR’ — the region’s largest 501c (3) 100% NO KILL animal rescue and adoption nonprofit organization — there will be dog agility activities, ‘Love Our Pets’ care tips and training sessions and demonstrations, a meet-the-author-and-rescuers and book-signing for the new recently released “Rescuers Who Rescue” pictorial keepsake memoir featuring TCAR rescue pups and felines with Boca’s fire fighters and pet advocates, and much more. The younger set will have the opportunity to show both their ‘love and talent’ as they participate in painting The Great Community Paws Mural that will be later displayed at the entrance of the TCAR campus on Boca Rio Road (to be visible from the Florida Turnpike) and enjoy animal book storytelling sessions by local officials and community leaders. There will also be a ‘celebrities and their dogs’ scavenger hunt, pet-themed arts and crafts, and registration for TCAR Youth Ambassador program. Event co-chairs Bonnie and Jon Kaye of Kaye Communications, TCAR’s official PR and marketing firm, conceived the festivities and gathered a dedicated event committee representing a cross-section of the community to promote the features, advantages and benefits of TCAR as “Boca’s Own ‘Humane’ Society’” rescue and pet adoption center. Event-goers will learn more about TCAR’s safe haven for dogs and cats, the nonprofit’s life-saving mission and large scale rescue successes, community services, ‘adopt not shop’ initiative and variety of volunteer, sponsor and partnership opportunities. “Celebrating the companionship of dogs, we are looking forward to the first-ever ‘Smooch your Pooch’ challenge,” noted Bonnie Kaye, president and chief strategist of Kaye Communications. Details and judges will soon be announced to award winners in various categories: Cutest Smooch, Longest Smooch, Biggest Smooch, Most Memorable Smooch, and Funny Smooch, along with a Community Choice opportunity. Jon Kaye added that ‘The Great Doggie Bed’ Design Competition is open to home designers, artists, businesses, children and anyone else ‘who want to channel their puppy love’. Categories include the Most Macho, Most Pampered Diva-Style, Most Luxurious, Most Creative, and Boca’s Best.Winners in each category up to the top 10 will be auctioned in Couture Section at the TCAR’s 13th Annual Doggie Ball fundraiser at Boca West Country Club on March 22, 2015. The GDD&PF Tails & Tales Expo area will feature a showcase of healthcare and therapy providers, doggie day care facilities, pet supply vendors, product and service companies, pet ‘art in the park’, etc. Exhibitor tents, sponsorships and partnerships are available and encouraged. TCAR receives no local, state or federal government funding for operations, medical treatment and housing. Saving lives in Palm Beach, Broward, Miami-Dade and Martin counties and beyond, TCAR has been a protective haven to thousands of abandoned, abused or neglected dogs and cats from other facilities in South Florida, Treasure Coast and as far as Sarasota, Alabama, Tennessee, Oklahoma, Louisiana, the Bahamas and most recently abroad from Istanbul, Turkey. A top-rated animal rescue center not limited to regional borders for large scale rescue efforts, TCAR has rescued more than 50,000 animals since its inception in 1996, offering homeless pets a welcoming forever home, either on campus or through carefully vetted adoptions that total more than 4,000 per year. Located at 21287 Boca Rio Road, Boca Raton, Florida 33433, TCAR is open for adoptions five-days-a-week Tuesdays, Thursdays, Fridays, Saturdays and Sundays from 10:30 a.m. to 4:00 p.m. For frequent updates or more information on TCAR, visit tricountyanimalrescue.com; connect via facebook.com/TriCountyHumane, twitter.com/TriCountyARand Instagram/TRICOUNTYANIMALRESCUEFL. 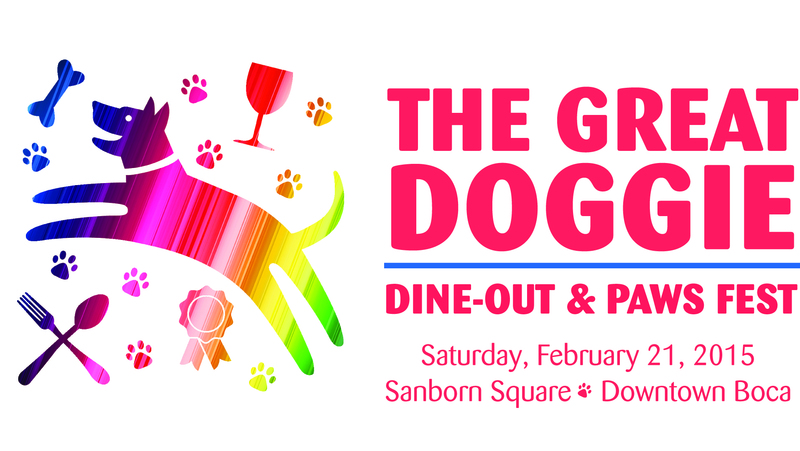 For more information on The Great Doggie Dine-Out & Paws Fest and related programming, sponsorship, partnership, exhibitor and volunteer opportunities contact Jon Kaye (jkaye@kcompr.com) or Victoria Jones (vjones@kcompr.com) at Kaye Communications 561-392-5166.